Last week I was invited together with a group of talented bloggers, to attend a fantastic cookery masterclass organized by the awesome team of Great British Chefs. The special guest of the event was michelin-starred Adam Gray, executive chef at Skylon restaurant and one of the most talented chefs in UK. 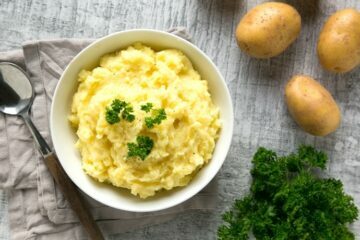 It was a great opportunity to learn more about British cuisine, and easy professional techniques to make stellar dishes in the comfort of your home. 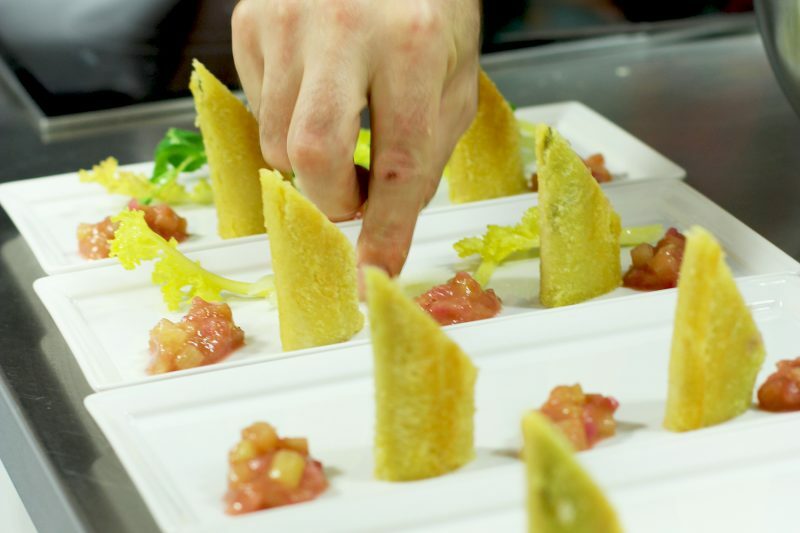 Chef Adam and his sous chef Damon showed us how to make a simple yet showstopping 3-course meal, highlighting some of the best English ingredients. 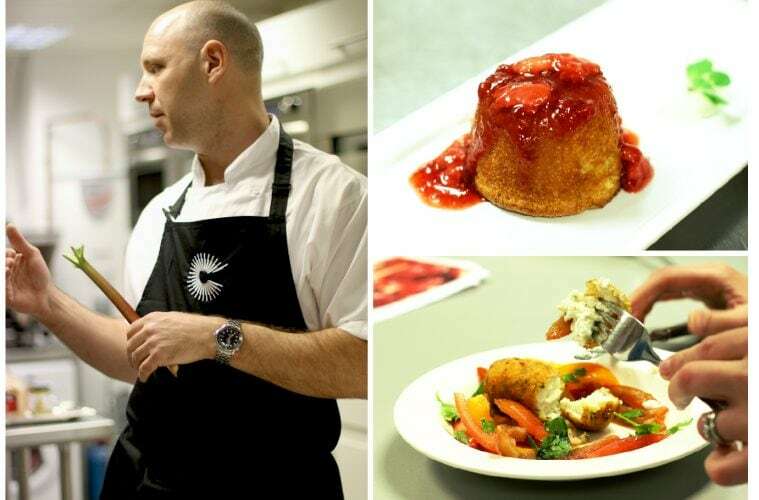 Being a proud supporter of British cuisine, chef Adam only uses local products. He visits and sources personally each ingredient used in his kitchen, making sustainable choices, following the seasons, while trying to keep the food costs at a manageable level. These are simple but precious food tips and can be easily followed at home too. We kicked off with chef Adam’s cooking demo for making an extremely easy and yet beautiful mackerel entree. After a step-by-step fish filleting tutorial, Adam moved on and prepared this Crispy Cornish Mackerel with Rhubarb Relish and a Pea Shoot & Sea Kale salad. As fancy as it sounds, it’s basically a spring roll and is impressively easy to make. 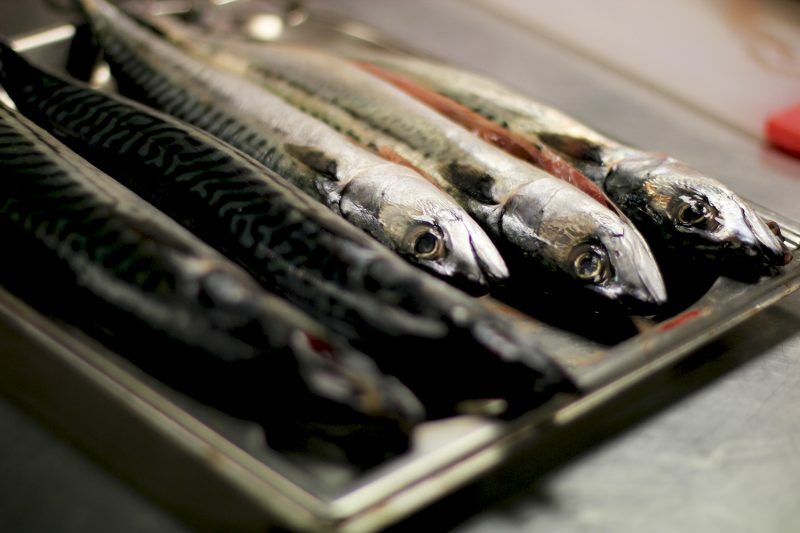 The mackerel fillets are simply wrapped with very thinly sliced bread, and gently stir-fried until golden and crispy. 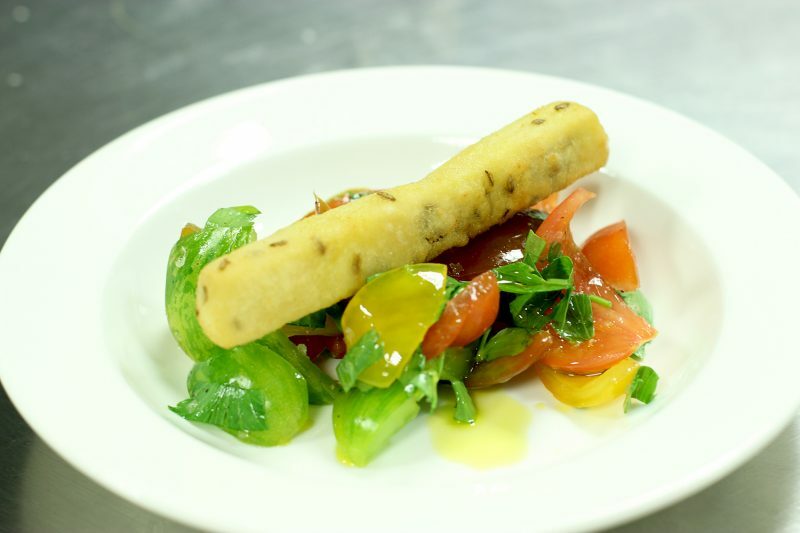 The result is an outstanding, fresh and impeccably plated appetizer. This beautiful dish is fun to make and packed with flavours, I can’t recommend enough to eat more mackerel fish at home. Not only it’s very cheap, but is also a sustainable choice. Sustainable means the fish is either caught or farmed responsibly, at fishing levels that allow fish stocks to maintain their populations and without jeopardizing the ecosystem in which they live. The main course was down to us to make. 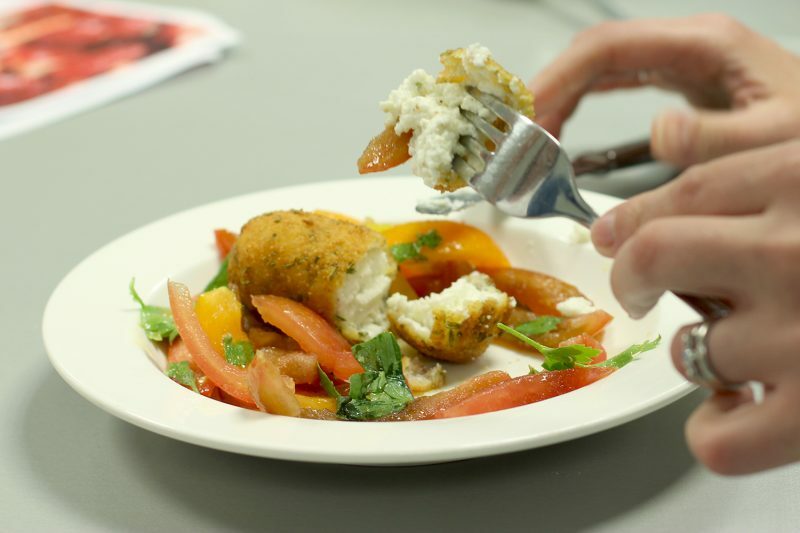 Supported by Chef Adam, who was giving tips and helping us all along our cooking journey, we prepared a refreshing vegetarian main course, Ticklemore goat’s cheese fritters with heritage tomato salad. This spring-perfect dish highlights some of the best British products: juicy heirloom tomato varieties, Ticklemore goat cheese and the often forgotten lovage, a flavorful aromatic herb. 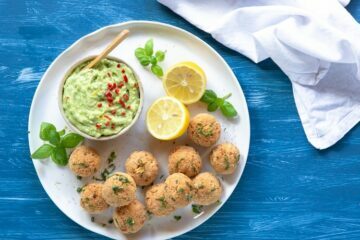 Making the cheese fritters is not difficult at all, after mixing the cheese with fennel seeds , it’s simply shaped into a sausage and freezed. Each cheese fritter is then dipped into egg wash and rolled into panko breadcrumbs. It’s very similar to the technique I’ve recently used when making deep-fried rigatoni. 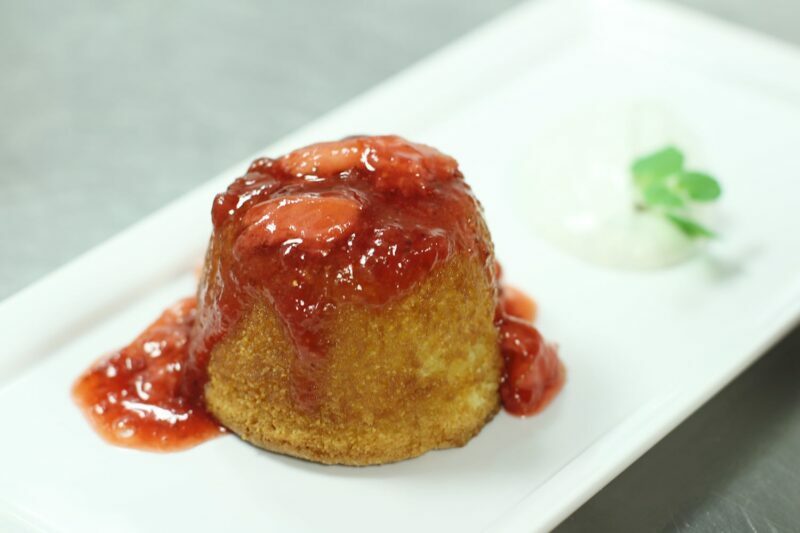 Finally it was time for dessert, and we prepared chef Adam’s Flourless citrus cake with English strawberries and vanilla yoghurt. This delicious cake is light and fluffly with a lovely combination of sweet and citrusy flavors, making it a great dessert not only for who’s on a gluten-free diet, but for everyone really. I was very surprised to find out chef Adam uses polenta to make this cake. 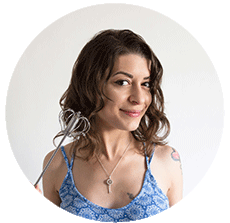 Being Italian, I’m more used to eat it as a savory dish, and it was an amazing discovery to learn polenta can be a great substitute ingredient for gluten-free desserts. You can find the recipe at the end of this post, it’s super easy and quick to put together, and really one of the best ways to make the most out of strawberry season. 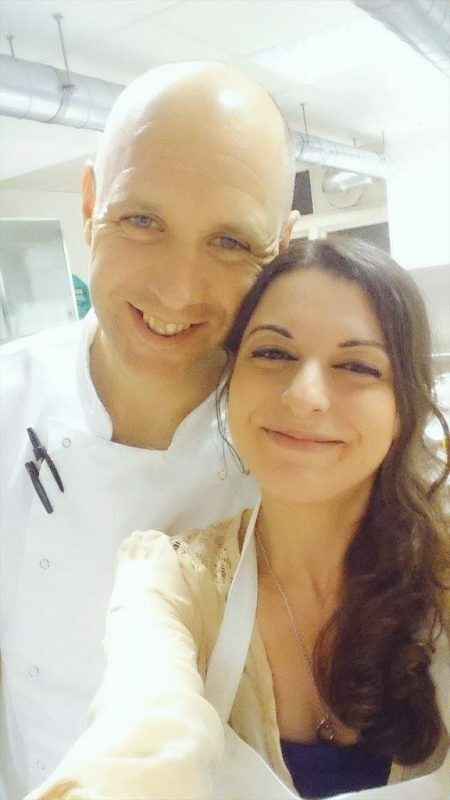 It was a privilege to learn new cooking techniques and tips from Chef Adam ( and I also managed to make a chelfie with him! ) . I’ve been a fan since he was head chef at Rhodes 24, where he worked hard to gain his own Michelin star, so it was such a honor meeting him and cooking his dishes. I can’t thank him enough for his time with us, and Great British Chefs for organizing this fabulous masterclass. Last but not least, a big thank you for hosting us to the Cookery School in Little Portland Street, London. Cooking in their modern and beautiful kitchen is a foodie dream! 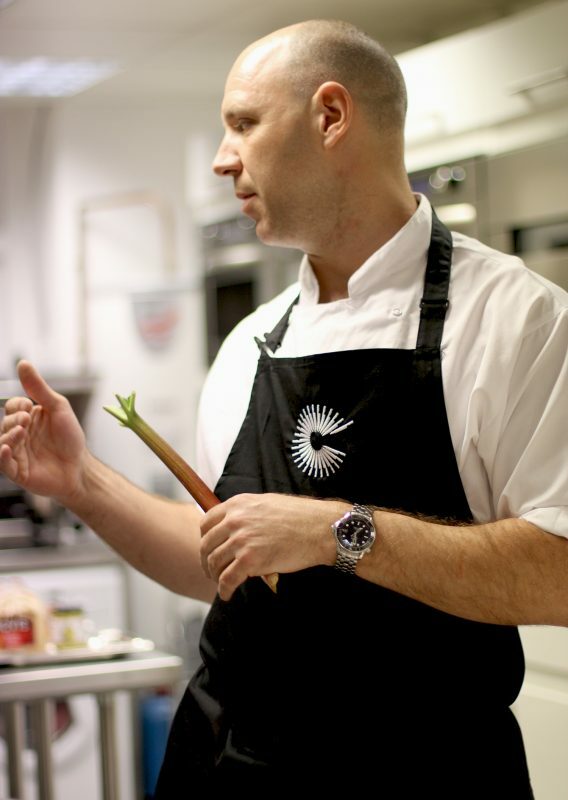 If you want to try all the recipes we prepared at the masterclass, you can download a special e-book of Adam Gray’s recipes from Great British Chefs Cook School. This gluten free cake is light and fluffly with a lovely combination of sweet and citrusy flavors - One of the best ways to make the best out of strawberry season! To make the flourless citrus cake, beat the butter and sugar together until light and fluffy. Add the eggs one by one, continually mixing. Fold in the polenta, ground almonds, and baking powder. Mix in the lemon zest and juice. is golden on the top. Remove from the oven and allow to cool. To make the soft strawberries, place the jam in a thick-bottomed saucepan and bring to the boil. Simmer for 3 minutes and add the quartered strawberries. Simmer for a further 2 minutes, then remove from the heat and pour into a tray to cool down. For the vanilla yoghurt, cut the vanilla pod in half with a small sharp knife and scrape out all of the vanilla seeds from each side of the pod. Mix the vanilla seeds with the natural yoghurt and place in a sealed container until required. Turn the cake cups upside-down on a serving plate, spoon the strawberry sauce over the top and serve with the vanilla yogurt. Enjoy! 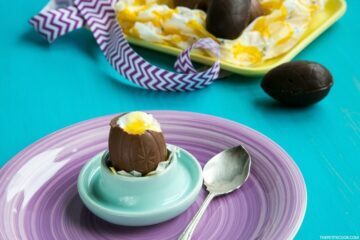 Recipe courtesy of Chef Adam Gray and Great British Chefs. wow this must have been so much fun! I’d love to do something like that oneday.